Exhibit from "The World of Jesus of Nazareth." Photo: November 2017. The Museum of the Bible (MOTB) in Washington, D.C. opened to the public in November 2017. Journalists, scholars, pundits, critics, and advocates have been keen to report on the attraction. Here, these reports are curated in hopes of documenting the discourse being produced about MOTB. Reports are arranged chronologically. Washington Post (Sept 12 2014), "Hobby Lobby's Steve Green has big plans for his Bible museum in Washington"
National Catholic Reporter (Feb 13 2015), "Work now underway on $400 million Museum of the Bible in Washington"
National Public Radio (Feb 25 2015), "D.C. Bible Museum Will be Immersive Experience, Organizers Say"
New York Post (May 12 2015), "The surprising truth about the Bible and modern bigotry"
Washington Post (Sep 4 2015), "Critics call it evangelical propaganda. Can the Museum of the Bible convert them?" The Atlantic (Jan/Feb 2016), "Can Hobby Lobby Buy the Bible"
Newsweek (April 7 2016), "The Messiah Cometh: Hobby Lobby's Museum of the Bible Descends on the Nation's Capital"
Toronto Star (Feb 5 2017), "Bible museum: is U.S. capital big enough for two gods?" Daily Mail (May 4 2017), "DC Prepares for $500 million opening of the Museum of the Bible which will house portions of the Dead Sea Scrolls and even Babe Ruth's own missal"
Tulsa World (June 16 2017), "Tulsans Involved in Building Museum of the Bible"
Salon (July 9 2017), "Museum of the Bible is busted: Inside Hobby Lobby owners' dodgy artifact practices"
PBS News Hour (July 28 2017), "Hobby Lobby thinks the Bible can save America. Now its museum has to convince its critics." Pittsburgh Post-Gazette (Aug 29 2017), "Monument to myth or history? Museum of the Bible to open in Washington, D.C."
Politico (Oct 15 2017), "Just What is the Museum of the Bible Trying To Do?" Science (Oct 16 2017), "Can the Museum of the Bible Overcome the Sins of the Past?" The Guardian (Oct 16 2017), "Inside the Sprawling, controversial $500m Museum of the Bible"
Chicago Tribune (Oct 19 2017), "D.C.'s huge new Bible museum includes lots of tech, not a lot of Jesus"
Eternity (Oct 19 2017), "Museum of biblical proportions set to open"
Christianity Today (Oct 20 2017), "Inside the Museum of the Bible"
America, the Jesuit Review (Oct 20 2017), "The Museum of the Bible is Ultimately a Leap of Faith"
Maclean's (Oct 25 2017), "Inside Washington's Strange New $500-million Bible museum"
PBS News Hour (Nov 9 2017), "The Museum of the Bible references Islam twice, and other things we learned on our tour"
National Public Radio (Nov 10 2017), "New Museum Invites Visitors to 'Engage' with the Bible"
The Wall Street Journal (Nov 13 2017), "Hobby Lobby Scion Spent Millions on Biblical Replicas--Then Came a Reckoning"
Curbed DC (Nov 14 2017), "Museum of the Bible: A Photo Tour of What to Expect"
Chronicle of Higher Education (Nov 14 2017), "The Provenance Problem: why a cloud hangs over the new Museum of the Bible"
Wall Street Journal (Nov 15 2017), "A Sweeping Portrait of the Bible"
Washington Post (Nov 15, 2017), "The new Bible museum tells a clear, powerful story. And it could change the museum business." Bible History Daily (Nov 15 2017), "Museum of the Bible: part museum, part Holy Land Experience"
Business Insider (Nov 16 2017), "Hobby Lobby president-backed Museum of the Bible set to open"
Washington Post (Nov 16 2017), "The new Museum of the Bible confronts the challenge of presenting slavery and the Confederacy"
CBS News (Nov 16 2017), "Inside D.C.'s controversial new Museum of the Bible"
NBC News (Nov 16 2017), "Museum of the Bible gears up for opening in Washington amid proprietary questions"
Smithsonian (Nov 16 2017), "Can the Museum of the Bible Deliver on Its Promise?" HuffPost (Nov 16 2017), "Museum of the Bible, Brainchild of Hobby Lobby Owner, Set to Open in D.C."
New York Post (Nov 16 2017), "Controversial Museum of the Bible is D.C.'s newest hot spot"
Artnetnews (Nov 17 2017), "Praying for Success: in the Wake of Scandal, Can the Museum of the Bible Find Mass Appeal?" National Geographic (Nov 17 2017), "Forgeries May Hide in Museum of the Bible's Dead Sea Scrolls"
Jewish Telegraphic Agency (Nov 17 2017), "Judaism is the Star at a Bible museum built by Hobby Lobby"
The Economist (Nov 17 2017), "The Museum of the Bible opens in Washington, DC"
Time (Nov 17 2017), "The Family Behind a $500 Million Bible Museum Hopes to Change Washington"
VOX (Nov 17 2017), "A Bible museum is a good idea. The one that's opening is not." New York Times (Nov 17 2017), "Years in the Making, Bible Museum Opens in Washington"
Think Progress (Nov 17 2017), "The new Museum of the Bible tries really hard to be apolitical. But is that even possible? NBC News (Nov 18 2017), "Museum of the Bible opens in Washington, D.C., with celebration amid cynicism"
ABC News (Nov 18 2017), "Museum of the Bible faces revelations, controversy as it opens"
The Atlantic (Nov 18 2017), "What's Missing from the Museum of the Bible"
Washington Post (Nov 18 2017), "'I had to be there': The Museum of the Bible opens in the nation's capital"
Washington Post (Nov 20 2017), "The ark v. the covenant: The dramatic contrast between the Creation Museum and the Museum of the Bible"
The Federalist (Nov 20 2017), "What's Inside DC's New $800 Million, Theme-Park-Influenced Museum of the Bible"
Washington Business Journal (Nov 20 2017), "Bible museum architecture soars in subtle and magnificent ways"
Forward (Nov 21 2017), "We Went to the Museum of the Bible - So You Don't Have To"
Slate (Nov 21 2017), "There Is No Such Thing as the Bible"
Chron (Nov 25 2017), "Museum of the Bible, built by Hobby Lobby owner, opens in D.C."
The Atlantic (Nov 26 2017), "The Museum that Places the Bible at the Heart of America's Identity"
National Review (Nov 28 2017), "Museum of the Bible: Hobby Lobby President Brings Religious History to D.C."
First Things (Nov 29 2017), "The Battle Over the Museum of the Bible"
City Lab (Nov 30 2017), "Good Book, Weird Museum"
The Asbury Collegian (Dec 1 2017), "Museum of the Bible"
Irish Times (Dec 2 2017), "Bible museum stands as testament to homogenous US"
Arlington Catholic Herald (Dec 4 2017), "A Short Visit to the Museum of the Bible"
The Trumpet (Dec 13 2017), "The Truth Behind the Museum of the Bible controversy"
The Federalist (Dec 18 2017), "Why You Should Visit the Museum of the Bible Even If You're Not Religious"
Washington Post (Dec 20 2017), "Is the Museum of the Bible that tourist-destination evangelicals have been waiting for?" 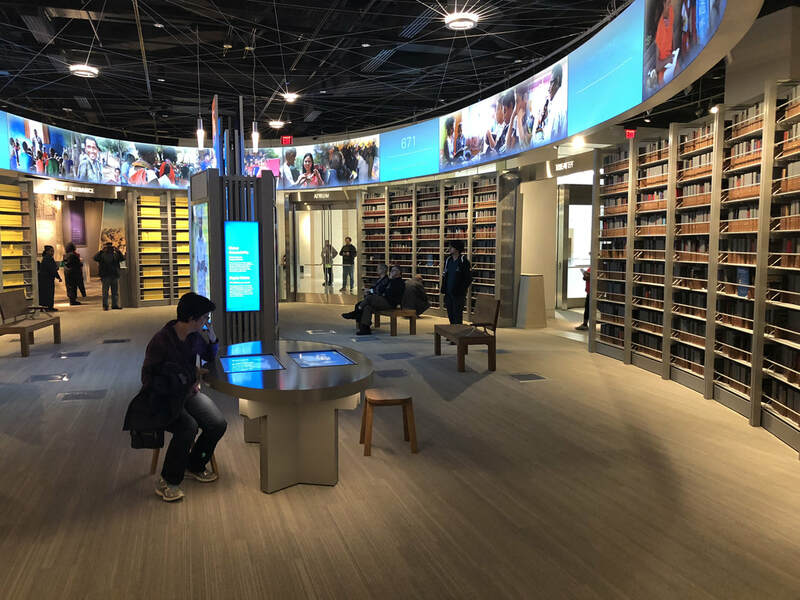 Religion News Service (Dec 25 2017), "In the Capitol's shadow, Museum of the Bible readies for opening"
Washington Post (Dec 27 2017), "Washington's huge new Bible museum talks a lot about Jews. So why are some Jews so skeptical?" The Jewish Link (Dec 28 2017), "A Rabbi's Take on the New Museum of the Bible"
Meridian Magazine [LDS] (Dec 28 2017), "Experiencing the new Museum of the Bible in Washington, D.C."
Mosaic (Jan 2 2018), "Who's Afraid of the Museum of the Bible?" Chicago Sun Times (Jan 5 2018), "The Museum of the Bible debuts in Washington, D.C."
New York Times (Jan 6 2018), "The Museum of the Bible is a Safe Space for Christian Nationalists"
The Jerusalem Post (Jan 6 2018), "Where focus on the Bible is more than a hobby"
Lapham's Quarterly ​(Jan 8 2018), "The End of History at the Museum of the Bible"
The Catholic World Report (Jan 8 2018), "A Catholic Tours the Museum of the Bible"
Philanthropy Roundtable (Winter 2018), "A Walking Tour of the New Museum of the Bible"
Commentary (Jan 17 2018), "The Bible Comes to Washington"
Amarillo Globe-News (Jan 27 2018), "Director with Amarillo ties says Museum of the Bible in Washington, D.C., is nonsectarian"
Mosaic (Jan 29 2018), "The Impact of the Bible"
Christian Century (Feb 2 2018), "The Museum of the Bible is utterly inoffensive. The Bible is not." Haaretz (Feb 9 2018), "Bible Museum in D.C.: Less Science, More Indiana Jones"
Eidolon (May 3 2018), "Hobby Lobby's Museum of the Bible Steals; Does it also lie?" Commercial Integrator (July 9 2018), "Museum of the Bible: An Old Story Set to New Museum Technology Marvels"
San Francisco Gate (Aug 7 2018), "Is a biblical food the next foodie fad? This chef thinks so." Bible History Daily (Aug 29 2018), "A Review of 'Jerusalem and Rome: Cultures in Context in the First Century CE'"
Daily Beast (Sep 1 2018), "How the Museum of the Bible Exploits Jewish Tradition -- And Saves Its Evangelical Christian Donors Millions"
Daily Beast (Sept 15 2018), "Feminist Icon Florence Nightingale Would Be Horrified at the Bible Museum's Depiction of Her"
Religion News Service (Oct 10 2018), "DC's Bible Museum just hired a Jewish exhibits director as it overhauls its staff"
Daily Beast (Oct 22 2018), "Bible Museum's Dead Sea Scrolls Turn Out to be Forgeries"
Washington Post (Oct 22 2018), "Museum of the Bible in D.C. removes items billed as Dead Sea Scrolls after experts find they are not authentic." CNN (Oct 23 2018), "Bible Museum say five of its Dead Sea Scrolls are Fake"
NPR (Oct 23 2018), "Museum of the Bible Says 5 of its Most Famed Artifacts are Fake." The Times of Israel (Oct 23 2018), "Five proven Dead Sea Scroll forgeries only the tip of the iceberg, scholars say"
Hyperallergic (Oct 24 2018), "Dead Sea Scrolls at the Museum of the Bible Revealed as Forgeries"
The Atlantic (Oct 24 2018), "Dead Sea Scrolls Forgery Casts Doubt on the Museum of the Bible"
Religion News Service (Oct 25 2018), "Bible museum is the first in US to show mile-long illustrate Bible"
Inside the Illuminations exhibit. Photo: November 2017.